Joel Iverson admits he was a little nervous the evening last September when he walked into a church basement to face residents of the West End neighborhood. Well over 100 people were there, and the chances seemed good that a few of them might not appreciate a trio of young entrepreneurs wanting to open a brewery and tasting room in their southwest Atlanta community, which has long been underserved by retail and food options. The meeting had gotten somewhat heated, Iverson recalls, and neighborhood groups tend to be skeptical when proposals involving alcohol come before them. Toward the end of the West End Neighborhood Development meeting, he was called on by association president Stephanie Malinauskas to give his presentation. “I was expecting some resistance, but the moment she introduced me, everyone erupted in roaring applause,” recalls Iverson, who still sounds surprised by the reaction. While the promise of fresh beer could explain some of the crowd’s enthusiasm—one local described his neighborhood as a “beer desert”—mostly “people were excited that we were willing to invest in their neighborhood,” Iverson says. There will be much at stake later this year when Monday Night Brewing opens its ambitious second facility along with other tenants in a cavernous warehouse at the corner of Lee and White streets alongside a newly completed stretch of the Atlanta BeltLine. For Iverson and his partners, the move represents a gamble that the site will generate enough traffic to justify renting a 22,000-square-foot industrial space in a section of town that hasn’t seen significant economic development in decades. For BeltLine boosters, MNB could open the doors to a surge of new investment along the southwest corridor. And for residents of the West End, the prospect of becoming a destination for beer drinkers, bicyclists, and urban hikers carries the hope for a ripple effect of investment that could bring a new vibrancy to their community. At the same time, they want to protect the hub for working-class black Atlantans that’s rich with culture, historic architecture, and homegrown businesses from getting hit by the same rapid revitalization (and higher rents) that overtook Eastside Trail neighborhoods like the Old Fourth Ward. Initially, the company’s plan was far more modest in scope. “We were just looking for square footage,” says Jonathan Baker, who, with Iverson and Jeff Heck, owns and runs MNB. The brewery, which has operated out of its 20,000-square-foot headquarters near the Hemphill water treatment plant on Atlanta’s Westside since January 2013, had run out of room to store beer for barrel-aging, Baker explains. Soon, however, the partners decided that instead of simply encompassing warehouse space, the new site should include brewing facilities and a tasting room. This would not only bring in revenue and help raise the profile of their brand; it would foster the social connections that are part of the MNB’s mission statement. The partners considered finding a space in the suburbs to avoid Atlanta’s sky-high water rates; MNB’s water bill often tops $10,000 a month. They also looked at properties along the BeltLine’s Eastside trail, where rents are already climbing into the stratosphere. But they kept coming back to a pitch they’d received from Stream Realty for its new Lee and White development in the West End, just 11 minutes by car from their existing brewery. As many regular patrons of MNB’s four-day-a-week tours and tastings already know, the three partners were recent transplants to the city when they met in 2006 at Bible study. That year they all sold their homes and moved to the Westside to help launch a new church. At the time, all had solid white-collar jobs. The three began getting together in Heck’s garage on Monday nights to try out a $50 beer-making kit he’d gotten from his wife. 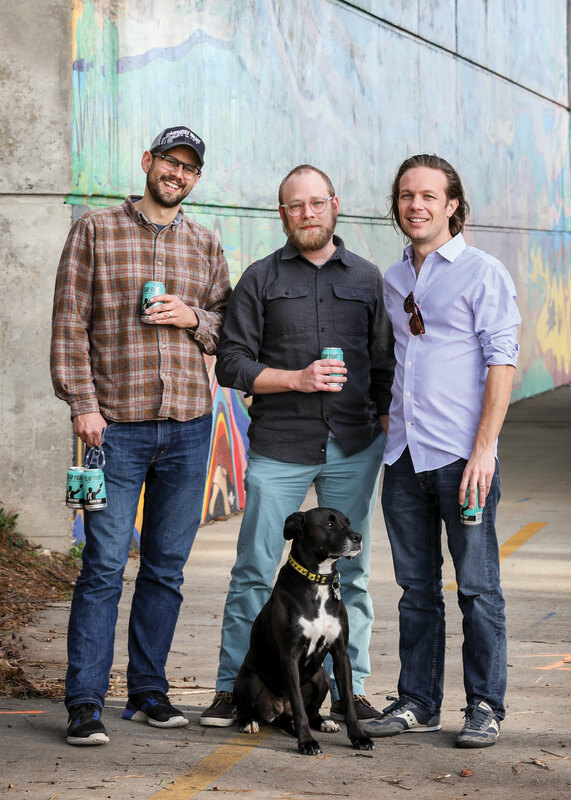 Over the next five years, they shared hundreds of batches of home brew with friends and acquaintances before deciding to launch their own company. In its first two years, MNB contracted with a brewery in South Carolina to make its initial two recipes while the partners searched for a facility of their own. There were talks to open shop at Ponce City Market, but the trio struggled for months to navigate Atlanta’s permitting gantlet. “We were the first brewery in Atlanta since SweetWater 16 years earlier,” says Iverson, who says MNB routinely received contradictory and seemingly arbitrary mandates from city inspectors. This included, at one point, a bill for $40,000 in “impact fees”—later reduced to a five-figure tally they found more affordable but no less capricious. Since opening four years ago in a warehouse off Howell Mill Road, MNB has by its own account become Georgia’s second-largest craft brewery by volume behind the massive SweetWater, producing almost 15,000 barrels in 2016. (The state’s second-largest beer maker, Athens-based Terrapin, was bought by MillerCoors last fall and is no longer considered a craft brewer.) Close to 100,000 visitors last year toured the estimated $5 million facility’s brewing room and sampled such beers as Drafty Kilt, a Scotch ale that’s emerged as its best seller. But for all the company’s successes, Baker points out, beer making is by nature a low-margin business. As a beverage category, beer has lost ground to wine and the burgeoning spirits market in recent years, and competition among craft brewers has never been more intense. As it grew, MNB could either expand distribution into neighboring states or try to boost its sales inside Georgia by venturing deeper into barrel-aging and souring to create new flavor profiles for beer nerds. The decision didn’t prove difficult, especially for Iverson, who, like his partners, is more interested in proving his brewing skills than in simply moving more product. Barrel-aging to produce more complex tastes has been done for centuries in countries like Belgium and has since the late 1990s become a hot trend among U.S. beer makers. It helps that barrel-aging typically uses wooden casks that once held wine or whiskey and doesn’t require a lot of expensive equipment. And yet, in designing its new West End facility, the MNB team hasn’t taken the easy path. In addition to its warehouse space, the company has leased land to plant apples, persimmons, Asian pears, figs, and more than 50 other varieties of fruit trees to create an urban orchard. Vents will allow wild yeasts from the trees to enter a special chamber in the building, where beer stored in a giant open vat will undergo “spontaneous fermentation,” a process that yields unpredictable flavors. A wooden deck to be built along the south side of the building will look across a retaining pond directly onto the new stretch of the BeltLine, and a footbridge to be built this summer will take thirsty walkers almost directly to MNB’s front door. Beer tasters will also be able to stroll through the planned orchard, as well as congregate in the breezeway between two wings of the sprawling Lee and White property. The brewery even has a five-year option on another 45,000 square feet of space in which to expand. Built in the 1950s as a supermarket, food manufacturing facility, and grocery warehouse, MNB’s new location is one of several old industrial buildings being redeveloped by Stream Realty—at a cost of up to $30 million—that together occupy a linear half-mile of BeltLine frontage. Stream also has signed Honeysuckle Gelato; Doux South Pickles from Decatur; cheese maker Southern Aged; and Relay, a bike-share vendor. 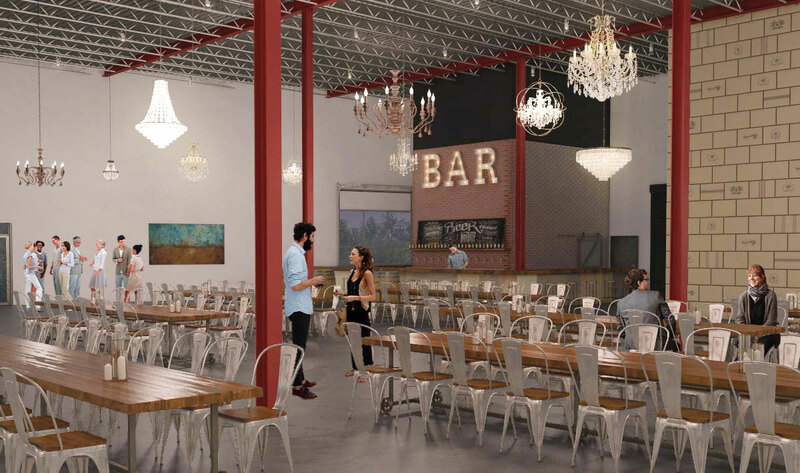 Other prospective tenants include a brewpub, distillery, and music venue. Stream comanaging partner Ben Hautt says Lee and White should be ready for business when the trail opens in late summer or early fall. MNB will be one of several tenants in Lee and White; others include a bike-share vendor, cheese maker, and gelato company. Showing off MNB’s new space on a recent sunny afternoon, as crews work to turn a dirt path into the BeltLine trail, Baker strikes a serious tone. “Its success will depend on the amount of traffic on the BeltLine, combined with a change in the beer laws,” he says, referring to the long-hoped-for state law that would allow breweries to sell six-packs on-site instead of going through an outside distributor. Georgia is one of just two states that doesn’t allow direct sales. As of early February, the General Assembly was considering a Republican-backed bill allowing limited direct sales. Although the BeltLine’s Morris says his organization doesn’t project visitor numbers, “We are very optimistic about the southwestern trail.” The completed portion of the Eastside Trail—running just two miles between Krog Street Market and Piedmont Park—drew more than a million and a half people last year. Just across Lee Street and the adjacent MARTA tracks sits a 16-acre former state farmers market that the Atlanta BeltLine plans to redevelop as a mixed-use site with lofts, so-called “urban manufacturing,” and a 100,000-square-foot event space, Morris says. The two properties will be linked by the trail, which will pass under busy Lee Street by way of an existing train tunnel. In addition, MARTA wants to build a new rail station where the BeltLine crosses under its tracks. “The BeltLine is rewiring people’s brains to see the southside as a destination in the city,” says Stream’s Hautt. And West End, a neighborhood with a complex history that has served as a getaway for the city’s gentry in the late 1800s, a mixed-income haven in the early- to mid-20th century, and a hub for Afrocentric bohemians and activists from the 1970s until today, is the epicenter of that interest. Malinauskas says it’s rare to find a renovated house in West End selling for less than $250,000. In nearby neighborhoods, listing prices for move-in ready houses have climbed above $200,000 over the past two years as BeltLine construction hums along and demand for affordable intown living grows. Although some longtime residents are concerned about new development pushing up housing costs, Malinauskas says most folks are looking forward to having quality food and entertainment options nearby. Brent Brewer, a nearly 15-year West End resident, says he and his neighbors have been told for years that the only businesses that they could attract without subsidies were fast food restaurants. 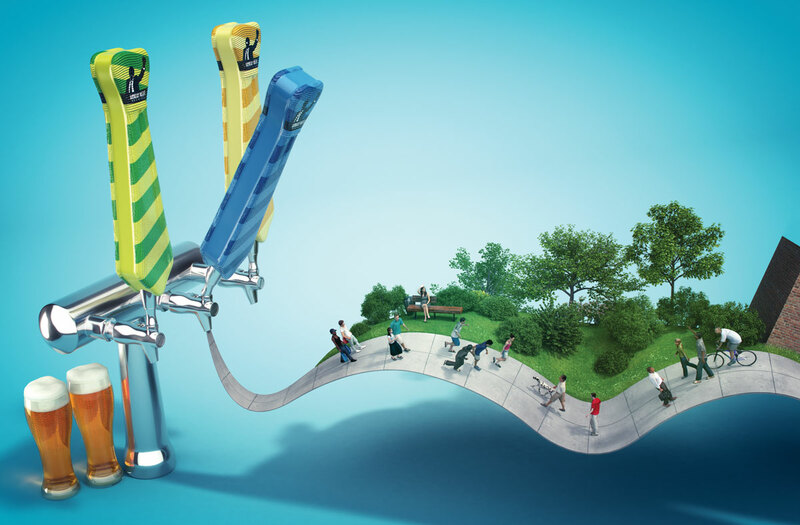 Ideally, the brewery and its fellow tenants will help attract more people to the new BeltLine trail, which in turn will spur more businesses to invest in the area, which will attract new residents and investment, thereby creating a virtuous circle that produces a more stable, safer, thriving neighborhood with a higher quality of life. “The promise of the BeltLine is not just the public space it creates, but the economic development that comes with it,” explains Robert Begle, an urban planner who helped develop the BeltLine master plan based on Ryan Gravel’s graduate thesis. Begle thinks the trail and the prospect of a new MARTA station could spark the redevelopment of a row of vacant, former industrial properties along Lee Street and a freight rail corridor. Many residents are applauding the changes but feel a tinge of anxiety about what the future could bring. Brewer hopes new retail and housing will, as in the neighborhoods abutting the Eastside Trail, benefit businesses beyond those located just along the path. Still, along with concerns about housing costs, some residents fear that new retail spaces will cause nearby property owners to raise rents on existing shops and restaurants. 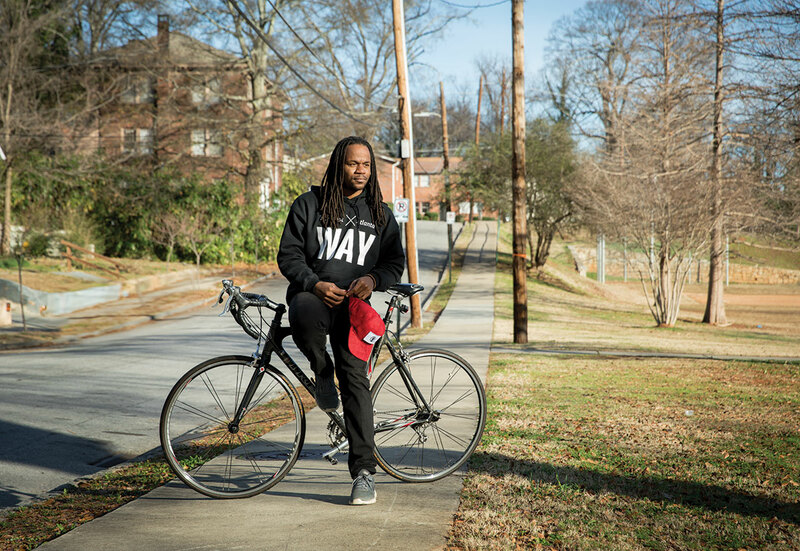 Shawn Deangelo Walton—the CEO of WeCycle Atlanta, a West End nonprofit—says it’s important that the West End and surrounding communities maintain their culture and history. Ideally, he says, developers building new housing and retail along the trail would support local nonprofits, encourage affordability to prevent displacement, and include residents in decisions. Doing so, he says, could help make the Westside Trail “the beacon of Atlanta when it comes to community-responsive development”—and preserve the character and culture that residents of West End and southwest Atlanta say they want to keep. Morris says it’s important not to be too optimistic about if and when additional development will happen. Areas around the Eastside Trail took off partly because they were surrounded by neighborhoods that already had a solid foundation: occupied homes, good schools, and shops and restaurants. Meanwhile, communities near the Westside Trail are still stabilizing after the Recession when foreclosures and mortgage fraud left empty houses and eroded property values. In the meantime, he says, the company hopes to cement its ties with the community by offering free event space to selected local nonprofit groups and hiring locals when possible. This article originally appeared in our March 2017 issue.